Enhance your natural ability to achieve new sales excellence. Become a more dynamic salesperson and take it all the way to the top. 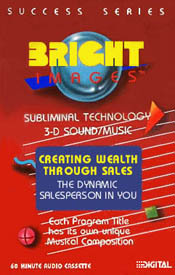 Reach financial independence by using this Creating Wealth Through Sales program. Powerful affiramations are directed to increase your sales skills to excell, to become a self-stater, a doer, become more organized, be intutive, more personable and knowledgeable about money, laws, business and taxes. This program is designed to help you with all these issues. When your living depends on your sales ability, you should be able to perform at your very best, at all times.